Folk rebels, Mawkin, fresh off the back of their three-times-BBC-Folk-Award nominated collaboration with Jim Causley, are now forging a bold new sound that strengthens their instrumental roots and embraces a new, exuberant exploration into the traditional folk canon from the British isles and beyond. The “unconditionally mighty” (Mojo) four-piece have augmented their sound with the addition of long-time producer Lee Richardson on drums and percussion. It’ll also be the first time that Mawkin will be interpreting traditional songs with singing duties shared between the band; a brave new direction indeed! The eagerly awaited follow-up to Mawkin’s critically acclaimed debut “The Fair Essex” is due for release in April 2012 and will be supported by a full UK tour of arts centres and theatres. The album will also feature a number of special guests. Expect the mesmerising guitar playing of David Delarre, the carnal beats of drummer and percussionist Lee Richardson; underpinning richly textured bass lines from Danny Crump. Add a host of wild and emotive melodies from the frenetic fiddling fingers of James Delarre inter-playing with the virtuosic bellowing of Nick Cooke’s melodeon and you have Mawkin. 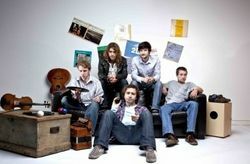 Mawkin have now played over 150 UK festivals. Their collaboration with Jim Causley saw them tour nationally, win the stamp of approval of BBC Radio 2 (Bob Harris and Mike Harding Shows) and saw them nominated for 3 BBC Radio 2 Folk Awards.